High Adventure Ranch - No Game, No Pay! For more information or to book a hunt! The Texas Dall Sheep was derived from cross breading Corsican and Mouflon Sheep. This beautiful animal typically has a bright white coat and weighs in at a hefty 140 to 150 pounds. Male Dall Sheep are called Rams and feature rounded horns that make for a very attractive and exotic mount. 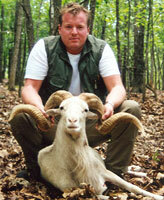 As such, they are one of our most popular Exotic Ram hunts. For more information on Texas Dall Sheep Hunting at High Adventure Ranch, please call (314) 209-9800 or fill out our contact form. International Adventure Hunting and Fishing Trips in Argentina, Mexico and Canada.